This past Saturday, I wrote a bit about an Ethiopian legend that St Raphael the Archangel once saved a church that had been accidentally built on the back of whale from being destroyed, by fixing the whale in place with his spear. This was accompanied by an image from the Walters Art Gallery which showed the Archangel driving his spear through the church, but the lower part of this image, where the whale was, is missing. 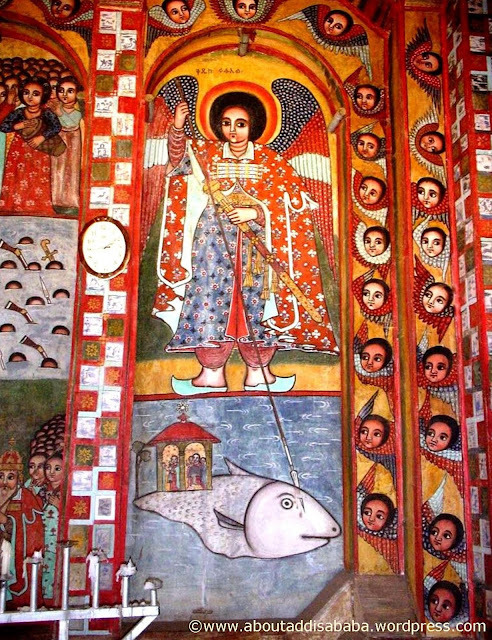 Here is a more complete representation of the story, depicted in a mural from a monastery in Ethiopia. This image is reproduced here by the very kind permission of Sara Genene, author of the blog About Addis Ababa. You can see more of her images from Ethiopian monasteries by clicking here.